(Nanowerk News) Tragedies like the E. coli outbreak in Ontario's Walkerton in May 2000 could be averted today with a new invention by researchers at York University that can detect the deadly contaminant in drinking water early (Analyst, "A hydrogel based rapid test method for detection of Escherichia coli (E. coli) in contaminated water samples"). "We have developed a hydrogel based rapid E. coli detection system that will turn red when E. coli is present," says Professor Sushanta Mitra, Lassonde School of Engineering. 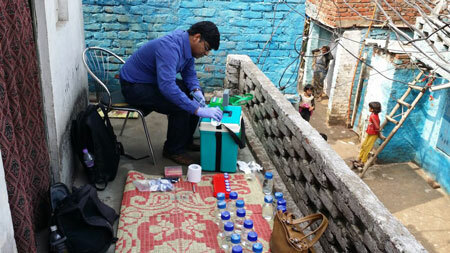 "It will detect the bacteria right at the water source before people start drinking contaminated water." The new technology has cut down the time taken to detect E. coli from a few days to just a couple of hours. It is also an inexpensive way to test drinking water (C$3 per test estimated), which is a boon for many developing countries, as much as it is for remote areas of Canada's North. "This is a significant improvement over the earlier version of the device, the Mobile Water Kit, that required more steps, handling of liquid chemicals and so on," says Mitra, Associate Vice-President of Research at York U. "The entire system is developed using a readily available plunger-tube assembly. It's so user-friendly that even an untrained person can do the test using this kit." The testing device uses the porous hydrogel matrix, developed by Mitra's team at his Micro & Nano-scale Transport Laboratory that cages specific enzymatic substrates that release certain enzymes in E. coli cells. These enzymes then chemically react with the substrates to change colour. If there is no E. coli, the colour of the hydrogel won't change, as there is no chemical reaction. The breakthrough invention has resulted in forming of Glacierclean Technologies Inc, an Innovation York spinoff company, in partnership with York U. "We have received a significant number of queries from related industries. We strongly believe that the product is in a unique position as the only one available in the market for rapid detection of E. coli," says Naga Siva Gunda, president and CTO of Glacierclean, talking of the commercialization plan for affordable rapid E. coli detection tool, adding that the company has recently hired a CEO.